Holy cow! This is our 30th party already! Time is flying! Today I want to introduce Hootie to you! Say “Hi” to all the nice people Hootie! A friend of ours, Katie, gave me a box of misc. craft things and in the box was Hootie! Thank you Katie! I thought this free grapevine owl would make a cute Fall decoration addition. But, I think he needs a nest! I didn’t want to go out and buy anything so, I rummaged through my stuff and came up with this. Now let’s take a look at a couple of fun posts from last week’s party! Finding Secret Treasures shared her Fall decorated mantel and hearth. Oh, I just love the rustic feel of this! Thank you ladies! Please grab the “I was featured” button below for your blog! Don’t forget to enter my Freschetta Proud to Support Pink pizza giveaway! Just click the picture below to enter! 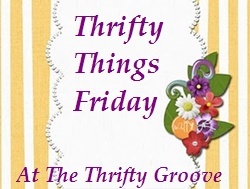 **Remember to link your thrifty post to this party post (not your blog) and you must link back to The Thrifty Groove on that post. Cute owl!! What a cute nest!! Very creative! Thanks for hosting this great party again! Glad to link up! Hootie looks at home in his new nest...good job! Thanks for the party each week!!!! Cutie - a - hootie. Thanks for hosting; this is a blast. Wow thank you for sharing our Halloween print! So glad you like it! And thank you for hosting, just linked up! We've started a thrifty link up if you or your readers ever care to join. Every Friday! Love your OWL! Thanks for featuring my Fall Decor! My first feature!!!! I am having trouble getting your feature button I will try again later, Thanks again! I love owls, especially at this time of year. (You have given me an idea.) I am afraid that I have yet to have buttons on my blog but I am sure that I will figure it out. You take great indoor decor pictures -any hints? Your owl is a hootie and a cutey. Thanks so much for your great Idea sweet lady and your comments on my new Tablescape Dinner For Two so sweet of you. I hope you are having a great weekend. Cute Hootie! I linked up on Friday or so while I was at a quilting retreat and I am back home and checking out some of your links today!